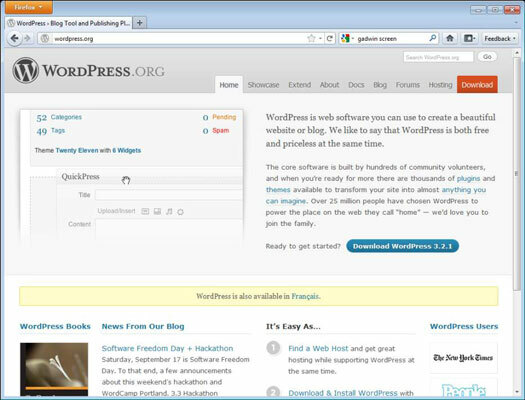 Some blog software is available as both a hosted service and a version that you can download and install. WordPress is one of those packages. References to WordPress are uniformly about the version of the software that you download and install on your own server. You can check it out online at www.wordpress.org. However, the option at WordPress.com is a hosted version. Fortunately, you can use both types of WordPress for free. When WordPress.com was launched, many bloggers rejoiced because WordPress had reached the blogging mainstream. Bloggers could now create blogs with ease and use the tools that they had come to love without having to tinker in the background or stress over how to maintain those blogs. Let’s break down the pros and cons of each version of WordPress. your blog posts safe. You can’t upload any custom widgets. WordPress It’s free. You must install and maintain the software yourself. Choosing a version of WordPress looks daunting, doesn’t it? It really isn’t. You just need to ask yourself these questions: How much control do you want to have over your site? Do you worry about not owning your content? Do you prefer freedom over ease? Still stuck? You can find additional information about the two options at http://support.wordpress.com/com-vs-org. WordPress is open source software, which means that its source code — the programming that runs the application — is freely accessible to developers who want to customize it or create new software from or for it. Also, you can freely distribute open source software, and no one places restrictions on how you (or anyone else) can use it. In fact, one of the few terms of using open source software is that you can’t place restrictions on the use or distribution of what you create from it.